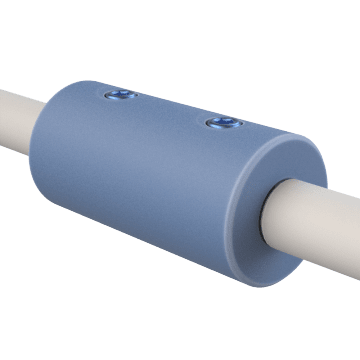 Shaped like a tube, these rigid sleeve shaft couplings (also known as solid sleeve couplings) slide onto the ends of two shafts of the same diameter to join the shafts so they can move together in the same direction. Rigid shaft couplings allow minimal backlash (or play) between the shafts and are suitable for continuous-motion applications. To avoid damage to the coupling, bearing, or shafts, they should only be used in applications where there is no misalignment between the shafts. You may have to remove other components on the shaft before installing or removing the coupling.